How did you find out about Leslie and her team? What were your first impressions of Leslie and her team? I was given Leslie’s book by a friend. The Emotionally Destructive Relationship is a really straightforward look at the things we do that are destructive. Not just the “Oh I wish that hadn’t happened” moment but the “over and over it keeps happening” moments. It was amazing to read that someone out there actually was willing to say that a spouse who “stonewalls” and refuses to resolve conflict is being destructive and that if they know it’s destructive and keep doing it that it’s an abusive pattern that must be addressed. But how? Up until this point, whenever I had shared with another person that my spouse was acting like this toward me, I would always be asked, “Well, what did you do?” Which only served to perpetuate the errant belief that I was responsible for the actions of my wife. It was in this confusion of mine that the book helped to start unwind the biggest deception in my own life: that my feelings, my thoughts, and my choices were somehow due to the emotions someone else was expressing toward me, the thoughts they were sharing with me, or the things they were choosing to do. I began to understand that no, that is not true. And instead of making me reflect more on how must I be a terrible husband somehow, the book helped me focus on what was I going to do next? Because that is my choice. That I had the power to choose. With that choice I looked up more information on her website and I found out she and her team did counseling. Although I was a husband and not a wife, I respected the work with women so much I asked if she would consider helping me. Certainly, I thought, some of what she shares with wives could help me too. My marriage is still difficult. I am still in the middle of experiencing hurtful words that attack the greatest things about me. But I see it for what it is – the words of my spouse, not the truth of who I am. I’ve been given so many “tools” to use. For example, I know what to do when I find myself in a place where I am sort of “lost”. That happens when you step away from the arguing. I know how to spot interaction where someone (anyone, not just my wife) is trying to “hook” me into playing a role that isn’t healthy for me to play. I never knew there was a different approach in those moments. I know that being a caring person is a great thing – but that in the course of my caring I must be very cautious to acknowledge my own limitations and not over-commit. If I don’t take care of myself, I will end up needing things from others in a unhealthy way – in other words I was in the habit of using people t o meet my needs that existed because I was unhealthy, instead of working to become healthy so I wouldn’t need those things. Because of these changes, my children (I had three in elementary) learned these things from me. Things are not perfect. There are still times I get upset, in front of the kids, and end acting totally different than what I should. But when that happens, I now do two things: 1) I apologize like I used to anyway, but I also 2) realize that if I am in that place, I need to address something in myself that is not right. It has become an aspect of feedback for myself. Over time, I realized that as weird as “taking care of myself” sounds, if I don’t take care of myself I will end up putting people in positions where they “must” meet my needs whether they want to or not. Part of taking care of myself is noticing when I am not okay. When we are not okay, we will seek out a remedy. A very bad remedy I tried was doing things for other people just to make myself feel better when they thanked me. I began complaining about how my wife would not appreciate me (talk about going straight to the emotional version of a temporary pain killer that only masks but does not heal – at some point they don’t work anymore). She refused to be super appreciative of how sacrificial I was being and how burned out I was becoming doing everything for everyone that they weren’t asking for me to do (over-functioning). Yet at the same time I refused to acknowledge the out of control need for appreciation I had that no one could meet. All a result of not being in a healthy place to begin with. I had not taken good care of myself. I had not protected the part of me that is my responsibility to protect. Just today I found myself thinking: we are taught to feed ourselves, bathe ourselves, dress ourselves – take care of ourselves physically. And some of us are taught to take care of ourselves emotionally. To the rest of us that sounds weird. Maybe that is because someone used us when we were younger to make themselves feel better. And we learned that’s what people are for – to make us feel better. And we end up settling in our own minds that if someone cares about us, they will do whatever it takes to make me feel better. And we don’t realize we treat them like a drug, not a friend – and not a wife. Taking care of myself emotionally means that I know how far my own emotions will last – and I don’t go further. Maybe that means the conversation with the insulting person will end and only be resumed later if they are able to be respectful. Maybe it means I need to cut way back on everything I am doing everywhere else so I can have more reserves for those at home I say I care about. For me it mean that if doing something means I will become bitter, I simply can’t do it. I finally understand what it means. It means some things you don’t trade away. There was a point in time where, for the first time in my life with my spouse, I was in a conversation that was destructive but I was not destructive, I was not uncomfortable, I was not bitter. I was steady, loving, and able to act and speak in a way that showed me how I was changing on the inside. Amazing moment for me personally! Another moment was realizing that I was doing a lot of waiting around for my wife to change. I learned it was okay to move ahead and lead. And that the reason I hadn’t already done so was because I wanted to move ahead together. Which highlighted that I actually thought I was the one that was needed to change her. So I gave it to God and moved ahead. I accepted that a “great” marriage (what I still dream of having someday) takes two. But a “better” marriage just takes one – and I can be that one. For a husband in a relationship with a destructive wife, or an emotionally distant wife, I would say to him: Take a deep breath. Sometimes the perseverance we think we have is simply a lack of realization that we are headed the wrong way. God used Leslie in my life. I was in serious trouble and was very concerned for my kids. I was afraid of what might happen and was sort of paralyzed. As it turns out, that’s not all that uncommon. Leslie and her team showed me in many ways how to interact with my wife (who had and still has deep emotional problems) as they interacted with me – I was a person with deep problems. Their manner of speaking to me encouraged me to consider how I was doing things at home. I remember being very focused in each session with Leslie on WHAT she was telling me to. Then, AFTER the session it occurred to me that she would be proven correct if I tried what she said – because I noticed her ability to interact with me and my thoughts and frustrations and remaining stable and centered, as she herself was in fact demonstrating the very skills she was telling me to try. I just hadn’t noticed at the time! 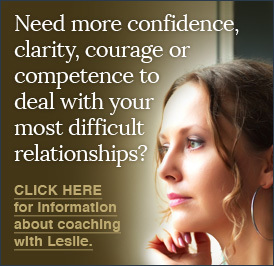 As a final thought – my marriage was sort of the focus of the coaching with Leslie. It turns out, however, that my unhealthy ways were affecting many relationships in my life. There’s a joke that asks “How many counselors does it take to change a light bulb?” The answer is “Just one, but it really has to want to change.” I was the guy who focused on changing what I thought was a burned out “relational” bulb. Man, I was really ready for change, but never could figure out why the change didn’t occur. What I didn’t realize was: there wasn’t a light bulb there in the first place, and I needed to stop putting my fingers into a live socket. Yep, I had learned most of what I knew by banging into things in the dark. Pretty frustrating. In this sense, maybe you know you’re in need of a light bulb for your own marriage. Maybe things have always been this way: not as bad as they are now, but even when you were first married there we re problems. When it’s dark, it hard to see. Starting my work with Leslie and her team was like asking in desperation for a candle in a dark hallway, and instead being given a surprise gift of a flood light. I’ll admit that part of how I knew I was making progress was that I did not like was I was “seeing” as the light was turned on. But it’s only possible to work on things you can see. The coaching was something I chose to invest it – I never looked at it as spending. And I was right. Sure, I could measure my time spent in terms of dollars – but what I received during that time cannot be. I continue to seek out Leslie’s team when I need wisdom in these areas and she is one of my most trusted advisors.